Leave the crowds at Mammoth behind on this nice loop. You'll get a little bit of everything along the way: views, idyllic meadows and, of course, beaver ponds! This is a great loop because it's close to everything, the scenery is fantastic and it's not too strenuous. Stay alert as this is bear country! Black bears and grizzly bears are commonly seen foraging in this area. This lower elevation run is great from late May through October. Summer brings spectacular displays of wildflowers. he Beaver Ponds Loop is a pretty mellow 5.4-mile loop that begins with a decent 350-foot climb up and above Clematis Gulch. The ascent takes place in a forested gulch, so there is a fair amount of shade as you work to gain elevation. At the junction with Sepulcher Mountain Trail, keep right to stay on the Beaver Ponds Loop. This is the high point of the loop and it's a nice descent (over undulating terrain) all the way back to Mammoth Hot Springs. Soon after passing the junction, the trail levels out and meanders through meadows and aspen stands. Look for elk and mule deer. These members of the deer family winter in this lower part of the park, and are commonly seen on this loop. Elk, or "wapiti" as the Indians called them, are the most numerous of Yellowstone's mega fauna. Mule deer are smaller and are easily recognized by their large mule-like ears. Did you know mule deer can use their sent glands to communicate? Eventually, the trail reaches the first of several small lakes known collectively as the Beaver Ponds. Look carefully for the effects of beaver. You may see circle cut trees or even a beaver dam or lodge. The beaver's powerful jaws and sharp teeth enable it to cut a five-inch tree in under five minutes and occasionally fall trees up to two feet in diameter. To construct a dam, they poke felled logs into a stream bed, then pile sticks, mud and gravel around them. The resulting pond covers the subterranean entrance to their lodge, making it almost impregnable. 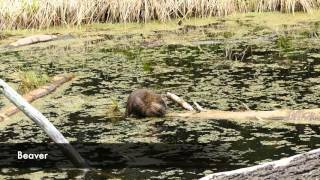 Beaver have dramatic impact on their surroundings. Their dams reduce the flow of water and create an environment conducive to many aquatic plants. In addition, waterfowl, including Canada geese, mallards, and goldeneye ducks, and mammals such as muskrat, otter and moose, thrive in such beaver-engineered environment. Watch closely for beaver. Although they are nocturnal, they can sometimes be spotted in the morning or late in the evening. Beaver are the largest rodents in North America and can weigh up to 60 pounds. Extremely well-suited for their aquatic life, they swim using their broad flat tail and partially webbed hind feet for propulsion. They can stay underwater for up to fifteen minutes and are equipped with special transparent membranes that cover their eyes, allowing them to see well underwater. They also have nostril and ear valves that close during submersion. The trail loops back to the right and passes a large pond. Sepulcher Mountain looms above to the southwest. After a short climb, the trail drops off the ridge and enters a sagebrush flats. As you continue, look for stands of white-barked, quaking aspen trees. Listen . . . can you hear them quake? A very slight breeze causes the leaves to rustle, creating shimmering sounds similar to a small brook. This special quality is primarily due to the flat rather than tubular construction of the petiole (stem) which connects the broad flat leaf to the branch of the tree. The flat edge is much more flexible than the more common tubular shaped stems, thus allowing the leaves to ruffle much more easily. Notice the dark areas around the base of the tree trunks. This is where hungry animals have browsed on the bark. Notice also that the trees grow closely together in stands. This is because new trees sprout from the roots of older trees. In the fall, it's easy to tell which trees are interconnected because their leaves simultaneously turn various shades of gold. As you head south across the flats toward Mammoth, you may spot an American antelope (pronghorn) grazing on the flats. These lightweight animals are extremely fast and agile, attaining speeds of up to 60 mph. Their tremendous speed and excellent eyesight protect them from predators. Neither of these attributes is much good in the forest, so they stick to open areas. The trail continues through open meadows and grasslands and ends above and to the rear of Mammoth Hot Springs Hotel. Thanks to guidebook author, Tom Carter, for sharing this trail description. To learn more about visiting Yellowstone, check out his book, Day Hiking Yellowstone. It was the presence of beaver that first brought white men to the greater Yellowstone area. In the 1820s and 30s, thousands of beaver were taken by such hardy trappers as Osborne Russell, Jim Bridger, and Johnson Gardner. In 1842 styles abruptly changed. Folks started wearing silk hats from Paris instead of popular felt top hats made from beaver fur. This brought an end to trappers visits to Yellowstone. Today, the beaver's continued presence serves as a reminder of Yellowstones rugged past. The beautiful rolling landscape of Yellowstone. First beaver pond seen on a snowy October day. Yellowstone NP - Beaver Ponds Loop. Finishing the Beaver Ponds Loop.